This is the first time a survey of this kind has been undertaken in general practice in the UK and indicates an area that needs more attention if primary care services are to help those in need. Just under one per cent of patients reported having a severe gambling problem, 4.5% reported problems that were low to moderately severe, and around 7% reported gambling problems among family members. Gambling has emerged as major concern for public health in the UK since 2007, when legislative changes allowed for huge growth in gambling availability and advertising. Unlike difficulties with alcohol or other drugs, however, there are no physical signs of problems with gambling and patients who need support are often overlooked until they experience major negative consequences, for example severe debt or relationship breakdown. 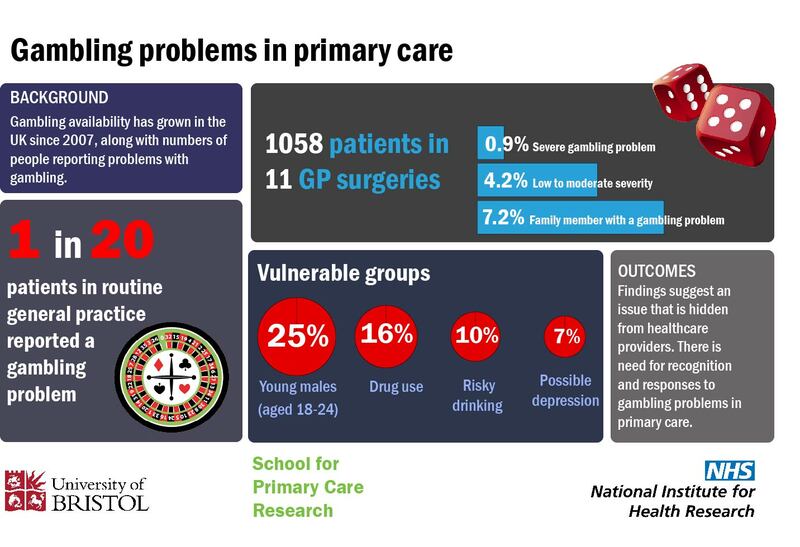 Gambling problems in primary care: A cross-sectional study of general practices by S. Cowlishaw, L. Gale, A. Gregory, J. McCambridge, D. Kessler published in British Journal of General Practice, 14 March 2017.